This past weekend, Amy officially completed her career as a collegiate athlete and in doing so, she left her mark. She was in Wisconsin for the NCAA D3 Track and Field, outdoor national championships. She was competing in the javelin, triple jump and, her personal favorite, the heptathlon (7 events for those that didn’t read the earlier post). 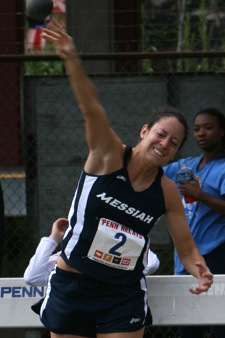 She finished the triple jump in the middle of the pack and placed third in the jav. In the heptathlon, however, she finished the first day in 5th place with 3 events to go on Saturday (all of which were her strongest ones). She DESTROYED everyone on the second day to not only win the national championship, but to set a national record for most total points EVER (5,111). On top of it all, she increased her all American status to 3rd-time and received the division’s highest honor of National Field Athlete of the Year. DANG! Messiah released sweet article about the whole thing you can read here.